This is one of the most unique activities Adventure Tours NI has on offer! Husky Trekking is usually reserved for countries of colder climes however we can bring you this fantastic experience, right here in Northern Ireland! Enjoy breathtaking views along scenic mountainous routes whilst being pulled along by a team of husky dogs. Gary Lineker has even joined us to try out this superb activity when he was filming for Northern Exposure on BBC One. After you are given a short brief and meet the dogs, you will be strapped into your specialized husky buggy and set off at speed through some of the most beautiful mountain trails in Ireland. Different sized sleds are available, holding 2 to 4 passengers. Husky Dogs used for this activity, are well-trained and friendly. Fully qualified dog handlers run your activity session so you will be in safe hands! As weather is unpredictable, we would recommend warm, comfortable clothing with waterproof coat and suitable footwear. Want to know more about Huskies? 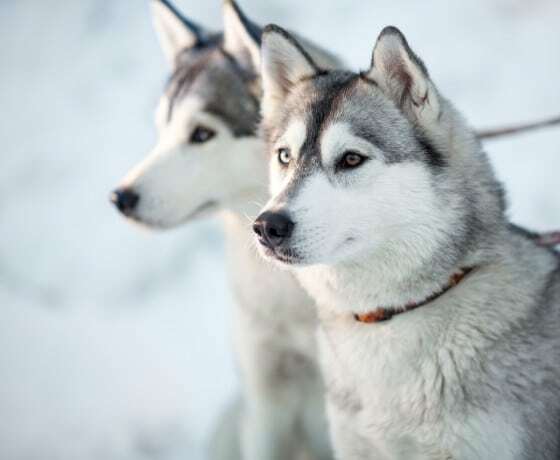 Husky Sledding dates back to ancient times but is more widely known over more recent years, with famous expeditions like that of Norwegian explorer, Roald Amundsen, who led an expedition with the aim of reaching the South Pole using husky dogs. The two varieties of Husky Dog used mainly used for sledding are Alaskan Huskies and Siberian Huskies. These are genetically distinct, with one bringing the sprinting capability and one, the endurance over long distance. Over time, these dogs have been bred to increase their capabilities and optimise their performance as sled dogs. It is known that many Alaskan Huskies are partially Greyhound, which improves their speed and some Alaskan Huskies are even thought to be part wolf, which attributes to their endurance levels. Alaskan Malamutes are typical husky breeds also commonly used as sled dogs. They are are large, strong dogs, weighing around 35 to 50kg, with recognisable features such as broad chests, thick coats and durable feet. Their core ability for sledding is huge pulling strength so they are commonly used for long expeditions and for hauling heavy cargo. Often used alongside the Alaskan Husky, they make a great team for endurance and speed. Smaller but similar in appearance to the Malamute, the Siberian Husky is one of the strongest husky breeds. The Siberian Husky is capable of pulling more, pound for pound than the malamute, though they have lower endurance levels, so can’t pull for long periods. These dogs weigh between 15 to 30kg and have been selectively bred for both appearance and pulling ability. The husky dogs used for sledding, are a mixture of many variant breeds of husky, each bringing its strength to the group. Teams of dogs are often kept together and work together. This maximizes their capabilities and performance, as handlers and mushers get to know each dog and can arrange the position of each dog in the pack accordingly.